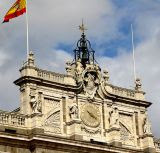 Belina's Adventures: Today We Go To Spain.... Ole!!! Today We Go To Spain.... Ole!!! Mejilones a la Marinera - Mussels Marinara.- We have these often as they are super easy to make and provide super flavor plus can be perfect for a weekend supper or company! In a large heavy pan put the oil to heat and add the onion and garlic. Stir for a couple of minutes until they begin to change color and then add the tomatoes, bay leaf and stir. Add the wine and the mussels and season lightly, don't over salt. Let cook only until the mussels open, then remove them and allow the sauce to reduce a bit and get some body (thicken slightly). 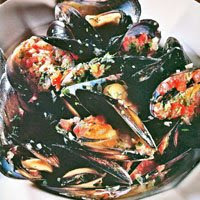 Just before serving, return the mussels to the sauce, combine well and serve topped with the parsley. Curry de Gambas - Shrimp Curry - Here's the easiest Shrimp Curry you can make without sacrificing any flavor! In pan over med-high heat add the butter, once it's melted add the shrimp, mushrooms, curry and ginger. Stir everything well and then add the coconut milk. Check seasonings and add salt and pepper if needed. and the dried fruits to get juicy. Top with the chopped basil. Serve with basmati rice or over pasta. Clean the fillets well. Put the oil into a large pan on moderate heat. Add the garlic and once they begin to get golden, add the fish fillets and cook them, turning a couple of times. Top with some of the "pimenton" and chopped parsley. Serve fish some of the garlic oil on top too. Curry Mayonnaise .- Here's a very easy preparation you can make to change the usual mayo into something different to use with almost any dish: fish, chicken, veggies, for salads or dips. Mix all ingredients really well until it all comes together. Keep cold. Note: Experiment changing the flavorings and you'll find that you can come up with so many different takes on this to use with most of your favorite dishes. You can make your own mayonnaise too if desired (only takes a moment). Tarragon is a wonderful flavoring too added with some dijon mustard and lemon; dill, chives, mint, red pepper flakes, white wine, etc. Add all ingredients into blender (or food processor or hand blender) and turn on, adding oil in a light stream until desired consistency is achieved. (You can also do this by hand with a whipper, but why? This only takes 1-2 min. this way, you can add any flavorings you like and have custom mayonnaise for any use and control the ingredients by eliminating chemicals, preservatives, colorants, salt and anything else you might be careful about).